Our Kitty Condos are the Cat’s Meow! Get ready for the best Pet Resort your pet has ever seen! Our facility features custom designed, indoor/outdoor dog suites, large grassy play yards, and personalized care just for your pets. Be sure to make your reservations early, we fill up quickly and you won’t want to miss the opportunity for your pet to be pampered by us! 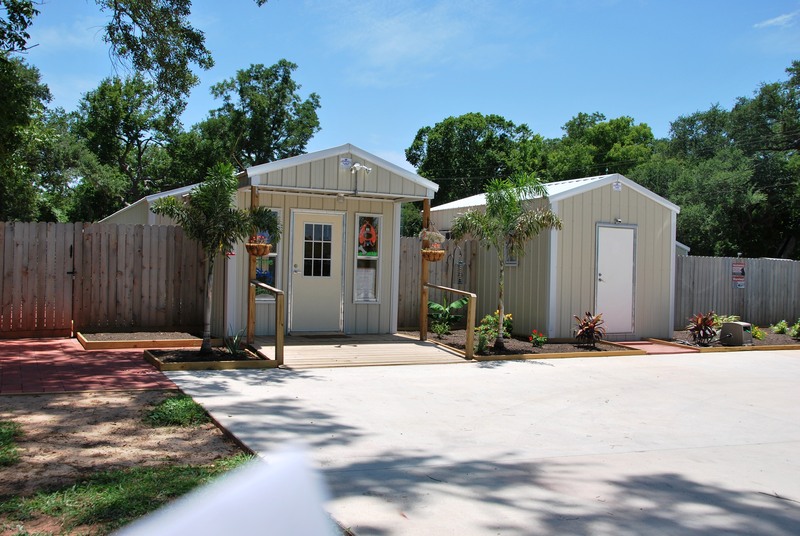 Pecan Acres Pet Resort at 105 Creekwood Landing Drive, Richwood, Texas. Pet Lodging for V.I.P.’s (Very Important Pets). You and your pet are important to us, so you can be assured that your pet will receive V.I.P. care while you are away! 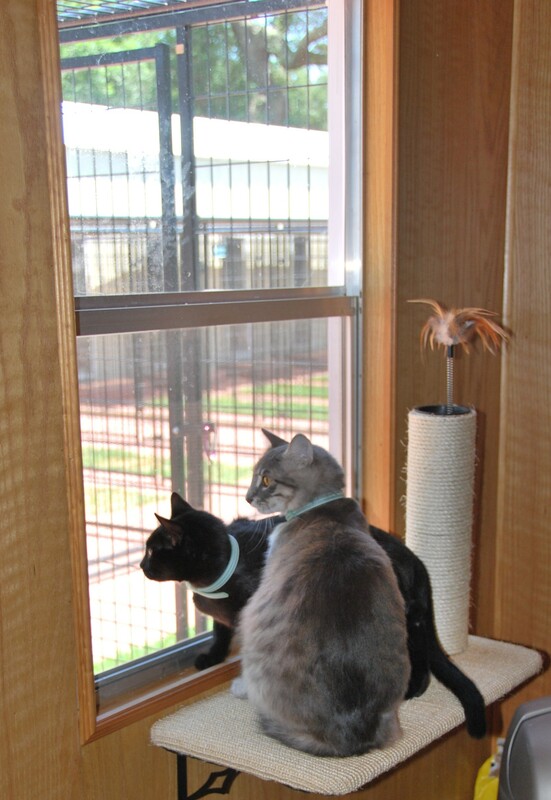 We provide veterinarian-supervised boarding, with daily play times, walks, lots of treats and individual attention. Dogs enjoy spacious climate-controlled suites, each opening into a private grassy play yard, complete with Kuranda pet cots and snuggly blankets. Your pet will be able to move freely from inside to outside and back throughout the day. The doggie door is specially designed to be gentle enough for even the smallest breeds to easily go in and out. Our team is trained to be in tune to your pet’s medical needs, and our veterinarian is available for any veterinary needs that may arise throughout your pet’s stay. Medical lodging and hospitalization is available for pets with special conditions that need careful monitoring, such as diabetes, seizures, or asthma. Our medical team will monitor your elderly or special needs pet carefully, administer prescription medications, and tend to any special circumstances as they arise. Although all of the pets in our care get lots of love and attention, you may add a TLC package to give your pet even more individualized care. What’s involved in a TLC package? You tell us–what does your pet enjoy? Long walks, special cuddle time, a pet massage, a brisk game of fetch? You tell us how to make your pet’s stay extra special. 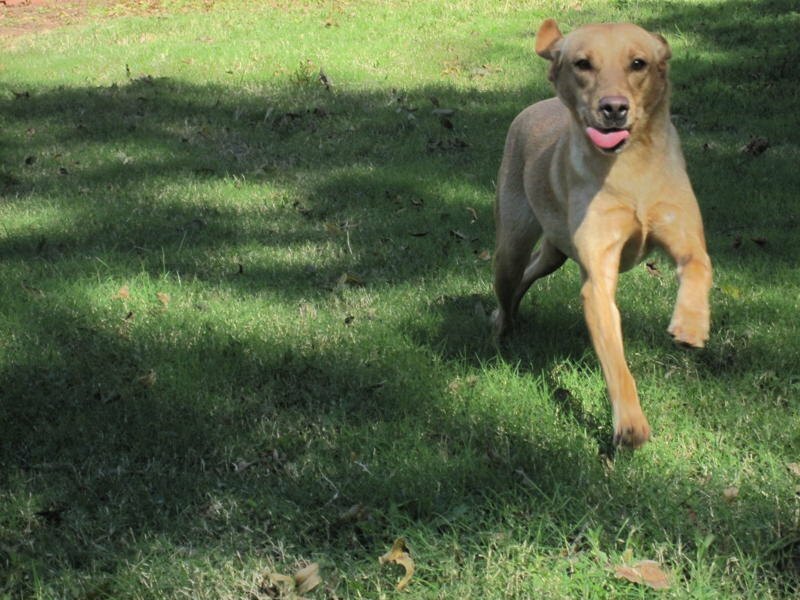 Dogs love to run and play in our giant, grassy play yards. Home alone all day? No way! Bring your pup to Doggie PlayCare and chase away boredom. Perfect for high-energy pups or dogs who become anxious or destructive when left alone. Also great for teaching your dog social skills. Your dog will enjoy a day of fun, including two group playtime’s and a suite to relax in. Add spa services and take home a sweet-smelling, worn-out pooch. Your pet’s safety is important to us. That’s why all pet guests who visit our Pet Resort must be current on vaccinations and be free of parasites. If your pet needs vaccinations or parasite control, we will be happy to take care of that for you when your pet arrives. If you are not a current veterinary client at Pecan Acres Pet Care, you must bring written proof of your pet’s vaccination history. Please be sure to let us know how to contact you while you are away. In addition, it is very important that you provide us with local contact information of a person who is available and willing to evacuate your pet in the event of a hurricane or other emergency that requires evacuation. Our Dog Suites are a spacious 5 feet x 5 feet on the inside. Our Large Dog Suites are 10 feet x 5 feet on the inside. 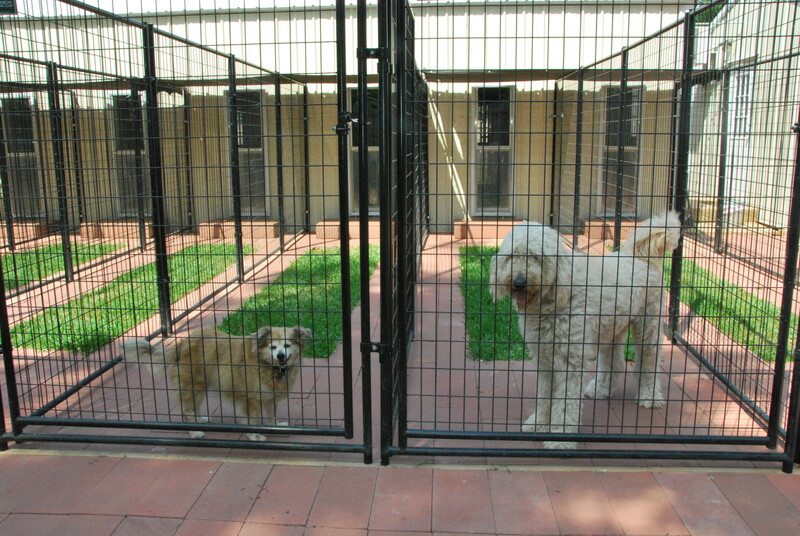 All of our Dog Suites open into 20-foot-long outdoor play yards. Your dog will love his very own private grassy yard. Take home a clean pooch! Let us treat your pet to the ultimate spa experience. We will start with a pedicure to gently trim your pet’s nails. Then we will give your pet a thorough bath with our Hydrosurge bathing system. This will remove all of the flea dirt, pollen, and pet dander which can cause your pet to itch. The Hydrosurge bathing system uses high pressure water massage to cleanse your pet’s skin and improve circulation. Most pets really enjoy their baths here and immediately start to feel better. During the bath, we will clean your pet’s ears and massage your pet from nose to tail. We will finish with a towel dry and brush out your pet’s coat, leaving you with a fresh-smelling, clean friend to take home. If you request spa services, please schedule your check-out appointment after 4:00 pm, so that we have plenty of time to work our magic. We want to avoid stress to your pet, so we do our best to maintain a dining schedule that is similar to what your pet experiences at home. Please bring your pet’s usual diet to avoid upset stomach and diarrhea. We will follow your feeding instructions as closely as possible. If you do not bring your pet’s usual diet, we will feed your pet a high quality diet designed for sensitive stomachs. There is an additional fee of $3.00/day/pet if you do not provide your pet’s usual diet. Please bring your pet’s food portioned into a separate, labeled, ziplock bag for each meal. We are happy to give your pet any treats you provide, however, please do not bring rawhide chews as they can become a choke hazard. Hello I’m wondering what your prices are for boarding large dogs, cats, and small animals? Please give us call at 979-418-8682 and we will be happy to put together an estimate based on your specific needs! Thank you so much! I read the hours at Pet Resort . So you don’t broad the days Thanksgiving week? I need my dog November 22 to 22-27 ? Thanksgiving Day and Friday after Thanksgiving our office will be closed for check-in and check-outs. How-ever, we will resume normal care for our guests those days! Please give us a call to make a reservation & with any further questions at 979-418-8682. Could you send your rates for boarding two small dogs per day . Please give us a call at 979-418-8682 and we would be happy to give you an estimate based on your specific needs! Thank you so much for inquiring! Pecan Acres Pet Care is a full-service veterinary hospital and pet resort owned by Dr. Jason Suazo. Our vision is to provide the most convenient, complete, and compassionate pet care available in Brazoria County, Texas, with an emphasis on exceptional client service and patient care. Our clients are our friends as well as our customers, and we value your continued trust and good will. Follow Pecan Acres via Email. Enter your email address to follow Pecan Acres and receive notifications of new posts by email. Can you spot the signs of heat stroke? We’re doing good deeds and we’d love for you to join us! What is Canine Distemper? Is your pet at risk?